One of the most requested posts (from insta stories yesterday) was sharing how to transition a wardrobe from summer to fall without buying everything new. I love this concept, and it’s super easy to do by only adding a few key pieces to your closet. 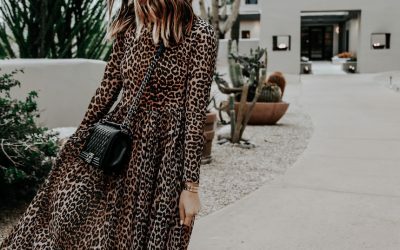 Long Sleeves – adding long sleeves is (thankfully) trending, so you can easily wear your silk camisoles or slip dresses into late fall without feeling weird about it. This is the look we’re talking about here and we love it. Some long sleeves we’re loving: here, here, and here. 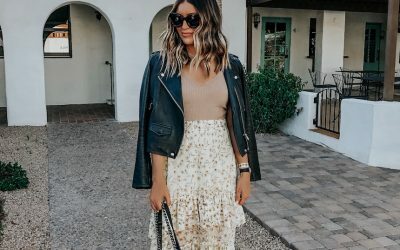 Cardigans & Jackets – Okay, if adding long sleeves is totally out of your comfort zone, you can go the cardigan/jacket route and layer them over your dresses and tanks. This is definitely one of our favorite ways to transition to fall. This outfit is the perfect example. This look is all over Pinterest – some amazing combos! Favorite cardigans: here, here, and here. Boots + Cropped Jeans – One of our favorite fall trends is boots with cropped denim. No need to store your cropped jeans until next summer, just throw on a great pair of boots (we’re obsessing over white boots) and you’re good to go! A couple of our favorite booties to pair with your cropped jeans: here and here. Tights & Boots – Wearing tights with boots under your skirts and dresses is such an easy way to transition those pieces into fall. This is a classic look & still one of our favorites. This look is so pretty – we’re obsessed! A couple outfits we shared last year that fit into this category. OTK boots under $200: here, here, and here. 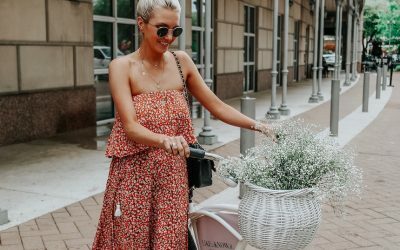 Maxi Dresses + Moto Jackets – We still love this look, and it’s an easy way to take any dress (not just maxi dresses) into fall. Here’s a post from a couple years ago wearing this look. Loving this moto jacket! Where are the black shoes from in your sweater and jeans outfit?! So cute!!! 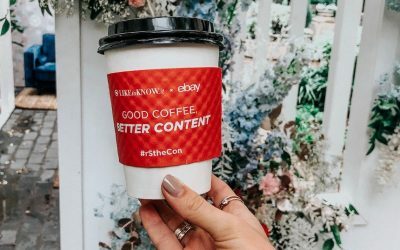 Where is the red dress from? Hi! Love the outfits! Where is Meggan’s bag from? Thanks! Where are Meggan’s jeans from in this picture? Love!